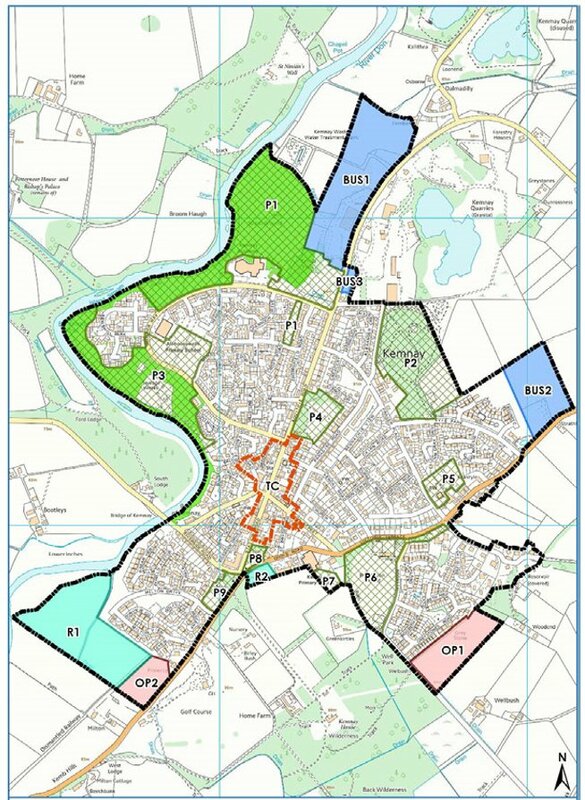 A map-based, interactive Aberdeenshire Local Development Plan (LDP) has been created to allow greater, easier interaction with the area’s planning blueprint. Previously available as either a hard copy, or in PDF format online, the new tool contains all LDP policies and lots of relevant additional information. Developers, community councils, local residents and others with an interest in the plan can all now access information quickly, easily and in more detail than ever before. It includes several interactive maps with details on heritage, climate, local areas and where development may take place in future. There are links to other useful documents and websites throughout the online plan. 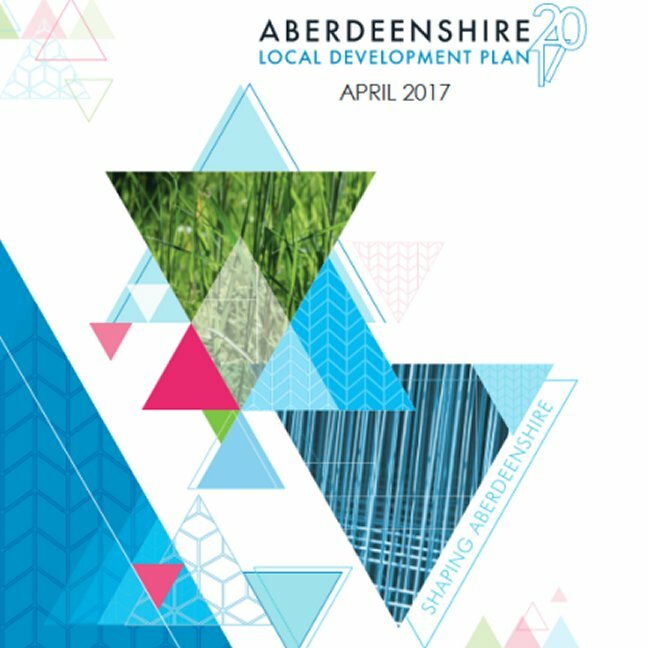 Aberdeenshire Council adopted its LDP in April after Scottish Ministers confirmed they did not require any modification to the document, paving the way for its everyday use in determining development proposals. Its adoption marked the end of a five-year process, which included two major consultation exercises, attracting more than 2,000 detailed responses, more than 30 committee meetings and a public examination. Work has already started on preparatory work for the Local Development Plan 2022. I am pleased to advise you, that, following consideration of the Scottish Government Reporters’ Report into the examination of the proposed Aberdeenshire Local Development Plan on 9 May 2017, we have published the plan Aberdeenshire Council would wish to adopt. Members accepted all the changes promoted by the Reporter in their report, without change, along with a range of requisite modifications consequent on the reporters’ recommendations. The plan we would wish to adopt also includes non-notifiable modifications such as minor wording and typographical changes. At the same meeting Members approved the adoption of eight elements of supplementary guidance. These were published and consulted upon at the same time as the Local Development Plan, or in the case of Local Landscape Designations and the Forestry and Woodlands Strategy subsequent to the 2005 Consultation. To comply with Part 2 of Section 19(12) of the Planning (Scotland) Act 1997 Aberdeenshire Council have sent: a copy of the modifications made following receipt of the Examination Report; the proposed plan we would wish to adopt; a copy of the report of the examination; a copy of the advert of our intention to adopt the plan; and the environmental assessment of the modified plan to Ministers. We expect to formally adopt the plan in on 17 April 2017.
within six weeks from this date 17 March 2017. On 13 March 2015 the Infrastructure Services Committee approved the Development Plan Scheme 2015. This document set out a programme for the delivery of a revised Local Development Plan over 3 years. Please also follow that link to see the Development Plan Scheme 2016 and subsequent programmes. The Main Issues Report sets out what officers identified as the key land use planning issues in Aberdeenshire. Its preparation involved a number of steps: identifying what the main issues might be; developing the options and alternatives set out in the Main Issues Report itself; and engaging with communities to explain the issues and seeking responses. More information about these can be found in the Main Issues Report section. We prepared and published a proposed local Development Plan in 2016. 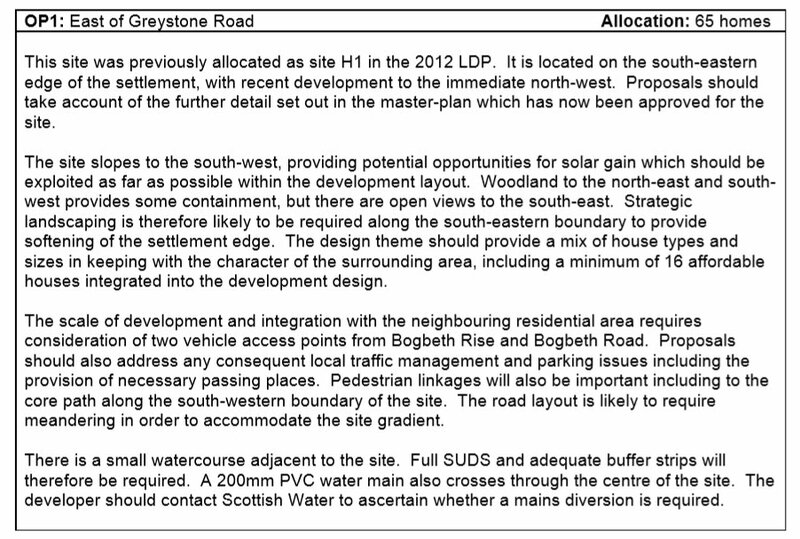 The proposed plan has now been superseded by the Aberdeenshire Local Development Plan 2017. Supporting documentation is now available in the Archive section. In total, approximately 899 representations were received regarding the Proposed Local Development Plan. The proposed Plan was lodged with The Directorate for Planning and Environmental Appeals for examination on 1 December 2015. The Directorate for Planning and Environmental Appeals submitted their Report of the Examination to Aberdeenshire Council on the 21 December 2016. The proposed Local Development Plan was lodged with The Directorate for Planning and Environmental Appeals for examination on 1 December 2015. The Directorate for Planning and Environmental Appeals submitted their Report of the Examination to Aberdeenshire Council on the 21 December 2016. Following receipt of the Examination report, officers presented the recommendations to the area committees in January and February 2017. The proposed Local Development Plan was presented at a meeting of full council on 9 March 2017. The council voted in favour of approving the adoption the Local Development Plan 2017. The Local Development Plan will next be sent to Scottish Ministers for full approval for adoption. Kemnay is a successful town set in the valley of the River Don. The settlement rises from the river, to the west of Kemnay, to higher ground on the east. The town centre and Academy highlight Kemnay’s role in the rural community, and the town also benefits from an employment area to the north which includes the famous Kemnay Quarry. There are large areas of open space in the town and good access to a paths network in the Fetternear Estate. Academy provision has presented a constraint to development in recent years, although an extension to Kemnay Academy in the short term, and a review of Academy provision in the Garioch area over the medium term, will help to address this. Development of an appropriate scale will help to meet local housing need, sustain and enhance services within the community, provide opportunities for employment and recreation, and improve links to the path network on the edge of Kemnay. The Fetternear Local Nature Conservation Site is situated immediately to the north of the settlement, in close proximity to BUS1. There is a small watercourse adjacent to site OP1. Full SUDS and adequate buffer strips will be required. There is a small watercourse adjacent to site OP2. A Flood Risk Assessment may be required, depending on proposals and site levels. Full SUDS and adequate buffer strips will be required. Site R1 is on the River Don Floodplain and can only be used for facilities that can withstand flooding. Site BUS1 is also adjacent to the River Don and any redevelopment would require a detailed Flood Risk Assessment. Strategic transportation: Contributions may be required to address the cumulative impact of developments on the trunk road network. Strategic drainage and water supply: Local sewer reinforcement may be required. Secondary education: All residential development must contribute towards provision of capacity at Kemnay Academy. Owing to secondary education capacity constraints, no development on allocated land can take place until secondary education constraints have been resolved. 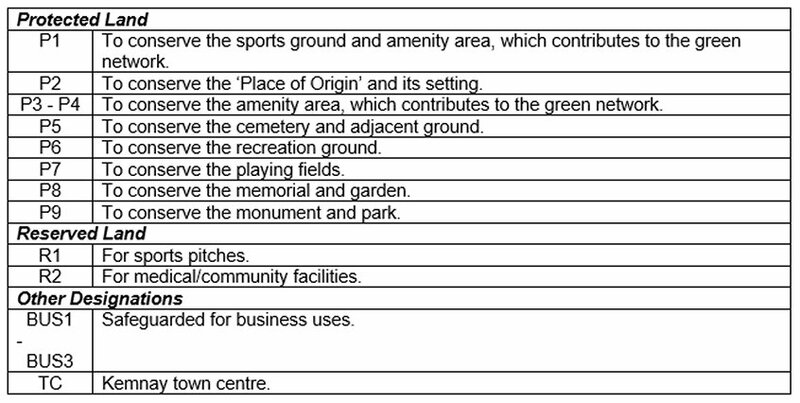 Community facilities: All residential development may be required to contribute towards facilities that serve the community in Kemnay. These may be identified in the Community Plan or relevant Community Action Plan. Sports and recreation facilities: All residential development may be required to contribute to indoor and outdoor sports and learning facilities in Kemnay. These may be identified in the Community Plan or relevant Community Action Plan. Waste and recycling: All development must contribute towards a household waste recycling centre in the Inverurie area. Health facilities: All residential development must contribute towards a replacement health centre in Kemnay (see site R2).